I realized there are hundreds of people in the very same position as my friend, so I decided to blog my reply to Janet. Well Jan, great question. I have to also ask you why you waited for the very last four years before retirement to begin planning for it. Janet is not alone in this position. There are millions of people just like her who are now facing retirement and wondering how their basic needs and expenses will be met, and knowing for the first time that the Government Pensions will not be sufficient to meet their retirement needs. The experts have told us for years that we need to make adjustments to our spending, increase our retirement plans and also save outside of our registered retirement plans. A few people took this advice and worked towards making some very big changes in their financial lives. If you have a company pension, that will be a great buffer if you are only now thinking of retirement planning now. You should decide on what percentage of your present income you will need for retirement. It is suggested that you will need between 80% – 70% of your present income. Well Janet, all is not lost – your situation is very common, and it is also fixable. Here are some things you can now do to get you ready for retirement. • If you still have a mortgage, increase your payment. This will bring your balance down considerably or maybe pay it off completely. • Treat your non-registered savings like a bill you owe to yourself. • It is important to complete all renovations to your home before retirement. • Is your car the one you will keep for a while? If so do all major repairs before retirement. If you are thinking of a new car, purchase it before retirement. • Open a Tax Free Savings Account (TFSA). Janet, by your retirement you should strive to be lean on what you owe and fat on what you own. Make it a passion of yours to save your money, then save some more money and cut down your debt, and then cut down your debt some more. The idea is to go into retirement free of all debt if possible, especially revolving debt. Janet, if you follow a few of the tips I mentioned it will make your retirement years just a little bit easier. My advice to everyone, begin saving for your retirement now whether you are 20 years old or 50 years old. It is never too early to begin planning for your retirement. With proper retirement planning in place it will make the difference between enjoying your retirement and wondering how you will pay for your basic needs. Retirement planning information is available at all the financial institutions around the country. Take some time to talk to your financial institutions about your retirement plans, set some goals stay focused and be diligent. Make your contributions automatically and regularly. 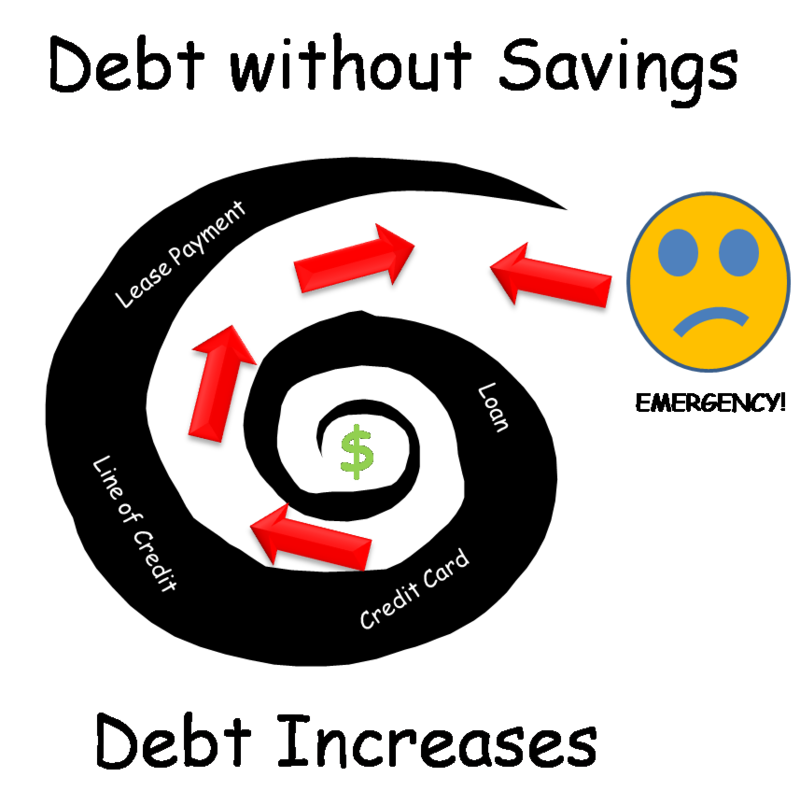 The Debt Spiral: How to avoid and stay out of spiraling into debt. How many times you have put all of your attention for years to paying off all your debts and then all of a sudden, with only a few payments left, a financial emergency shows up. That financial emergency could be a car that won’t start a broken furnace or an unexpected job loss. How did it make you feel when, just as you were ready to be free of all your debt, this emergency pops up its ugly head? The panic sets in and you feel defeated again because life is dealing a harsh blow and all your efforts were in vain. You now wonder why you even tried to pay off your debt just to be placed in the downward spiral again. You call a friend who is very sympathetic, but is unable to help you solve your financial problem. Pacing up and down the house, angry or crying, you know for sure there has to be a better solution. WHAT CAN I DO TO MAKE SURE THIS DOES NOT HAPPEN AGAIN? WHO HAS THE KNOWLEDGE AND WILLINGNESS TO HELP ME? You finally realize that you are the only one who can stop this downward, debt spiral. You decide to take control. You then say, “Is there someone else who can help me?” The Advisor replies, “Well, we do have a Financial Advisor who has more experience. Let me see if she is free. I will be back.” A few minutes latter you meet with the more experienced Advisor. You notice right away that she has a different approach. She shows and explains to you the Debt Spiral. Something clicks and you know WHAT you were doing wrong. You found WHERE to get help, WHO had the knowledge and most of all WHEN you will finally stop the SPIRAL. In your finances, you are your own advocate. You have to express yourself and keep asking questions. You know something is wrong and you seek help. Now you know that you must always save even while paying down debt. Take a very close look at the Spiral. It helps you realize that while paying off your debt you also should be saving, even if it is a small amount. 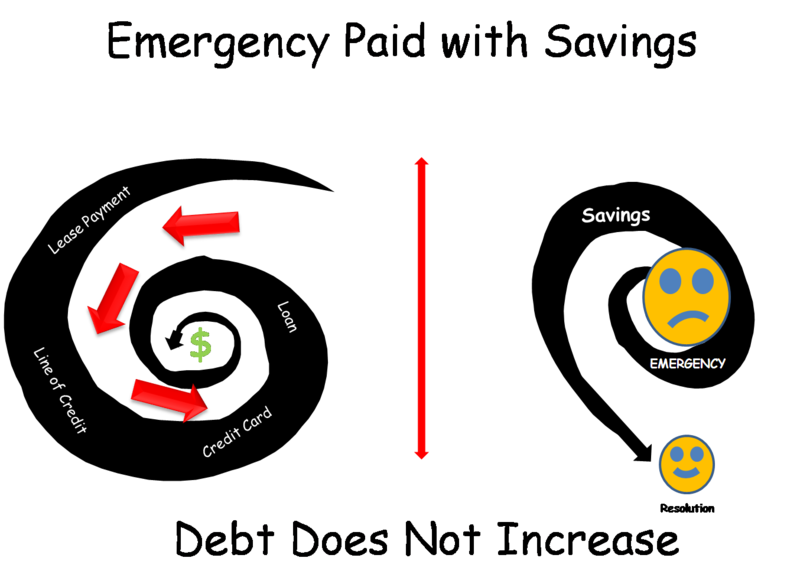 But, they must both be done simultaneously; paying off debt and saving so that when the emergency shows its ugly head you can use the savings to take care of it and continue paying off your debt uninterrupted. Your savings is always being done automatically so it grows steadily. If you are not focused on your financial plan you will make decisions that will keep you forever in the debt spiral. The person at your financial institution is there to assist you in meeting your financial goals. If, when meeting with them, you notice or realize that all they want, is to sell you the latest financial product they have to offer even if it does not match your financial goal, say no. You want someone who will hear and understand your needs and help you reach you financial goals. You need someone who is working for you, not for their quarterly sales bonus. Getting off the debt spiral requires planning and a little help from your bank. You can make this happen by having all your saving and payments done automatically. You are in control. I have a few tips or you on how you can shop smarter and save money. As your Financial Advisor after looking at your financial plan I make this statement to you “you need to shop smarter” I am sure your reply to me would be, what do you mean and how can I do that” What are the things we shop for the most? We shop for food the most it does not matter where we live or whether we rent or own our own home we always have to shop for groceries or buy some sort of food product. I would like you to take a complete inventory of all the food products in your pantry, kitchen cupboards, refrigerator and freezer. Make a list take photographs enter it on your computer on your I phone, cell or whatever portable devise you carry. Plan the meals you will be preparing for the next week or two. Next make a grocery list checking to make sure you are not purchasing something you already have on your inventory list. Be careful not to purchase package or prepared foods they cost more and are usually not that healthy. Check for all your coupons against your grocery list; look at the specials for the stores where you shop take these with you. You will also need a pen to cross off the things you have bought as you go along. Once you get to the store stay focus on that mission of shopping smarter, remember the store is a business in business to make as much money as they can and their plan is to get you to buy more than you need so they meet their target or bottom line and your job is to get what you need and no more which will save you money. If you are tempted to get something on special remember if store A has it on sale this week Store B will also have it next week. The manufactures wants the store to sell all their goods so they each get the special do not be tempted, stay on plan check your inventory list, you will find that you have six of those item already. The most important thing when shopping is to know what you want whether you are shopping for a House, a Car or a household appliance. Do your homework, know what you want and how much you want to spend for the item before leaving home. The person selling to you is in business to make money you are in business to keep as much as you can of your money while getting value for what you are spending. My co-worker she has stayed on her plan and she has taken that $65.00 she usually spent every two weeks and placed it in her vacation accounts. She is well on her way to a great vacation. What Small Business Owners need to know about Money. You have your own business and you are good at what you do but you realize that somehow you are not doing the right thing with the money you earn from the business. You buy your supplies and pay for them. Your customers are paying, some slower than others and sometimes you are concerned about you meeting all your expenses. You are sure it has to do with your knowledge of money management. I have some tips for you but first, there are a few questions you need to answer truthfully. 1: How often you go to the bank? 2: Do you get paid in cash from your customers? 3: Do you pay for you supplies in cash? 4: How do you pay yourself? 5: Do you have Petty Cash? 6: Collection of Government Taxes by the business, do you pay on time? When ever you have sales for that day, you should go to the bank at the end of business that day. Yes there are charges for depositing into a business account but these charges are deductable as a business expense. My advice to you is, if you are paid in cash you need to deposit that cash in your business account at the end of the business day. The reason for depositing your day’s receivable in the bank is to enable you to keep track of the income generated everyday. Failure to not make a deposit on a daily basis encourages you to use the cash for purchases not concerning the business such as your lunch or other incidentals. Sometimes, some suppliers will give you a discount if you pay in cash. When this happens, write a cheque from the company to cash, write the name of your supplier at the back of the cheque and if you have a receipt write the number on the cheque. This will make it easier for your accountant to reconcile your accounts. The best way to pay is by cheque but sometimes it makes sense because of the discount you are receiving. Pay yourself with a cheque. Write a cheque from the company to yourself for the amount you want and deposit it to your personal account. It is never a good idea to just dip into the cash and take whatever you want. Writing a cheque to yourself again makes it easier for the accountant and you will spend less time explaining to him what happened to the receivables and more time building your business. It is always a good idea to have a cheque written to Petty Cash which you can use for small purchases for the business making sure the receipts are also kept for the accountant. Never ever use the cash to make personal purchases. Collection of Government taxes by your company. I recommend that you have another account set up just for the Government Taxes. Too often the business owner is scrambling when it is time to remit the Government Tax you collected. Money due to the Government should be deposited in that account every time you go to the bank so when it is time to pay you are able to pay. Remember this is not your money. Owning your own business can be fun and also very challenging. It is best to hire a proper accountant rather than letting Auntie Maggie help you out. The cost of the accountant is deductable as a business expense and it will save you many stressful hours when the government comes calling. Make sure to file your business income tax every year. The most important thing you must remember is that you have to deal with the Government for Income Tax and Business Tax. Keeping proper records can make your life a lot easier if you have to deal with a government audit. These are some useful tips I would like every small business owner to practice.